For the last 35 years Government policy has been aimed at making us a nation of homeowners. From the Right to Buy to the deregulation of the banks, the main push was to get as many people as possible on the housing ladder and give us all a stake in capitalism. But now we face the biggest housing crisis for generations. House prices are more and more unaffordable and way beyond many people’s wages. Meanwhile private rents are soaring and so is homelessness (up 26% in four years and the numbers of people sleeping rough in London is up by 75%). The dream of the property owning democracy is now a nightmare. Back in the ‘80’s, rent regulations were being dismantled in line with the return of free market ideology. From then on landlords have been able to charge as much as they want, so long as they do not ‘price themselves out of the market’. At the same time the state was encouraging the ‘right to buy’: all part of the same policy of reducing state spending and artificially promoting the housing market. Prices started to boom. Estate agents, building societies, DIY stores flourished and makeover TV programmes made their first appearance. Even when the first crash happened in ‘91, prices kept on rising (by 90% between 2002 and 2007). The solution of the state – both Labour and the Tories – was to abandon caution to the wind, loosen up financial regulations even further and encourage everyone to mortgage themselves up to the neck. Easy mortgages for your overpriced house meant prices kept rising, and so did home ownership. But not any more. Since the financial bubble burst in 2007 – a bubble inflated by the banks famously ‘slicing and dicing’ mortgages to use as collateral for further speculative dealing, we’ve been on a trend back towards private renting. The dream of home ownership is still being peddled. But the reality is becoming a nightmare. Banks and building societies are trying to reduce their financial losses and are no longer inviting anyone and everyone to take out a mortgage or loan. Most households in London now rent and elsewhere the gap between those who want to own but can’t, has hit 5 million. Housing is still the object of financial speculation but fewer people can now pretend that being mortgaged up to the hilt guarantees a secure future. For private landlords, the current situation is a goldmine and some individuals are cashing in. (Private landlord Kevin Green, has personal wealth of £40m, and the family of one of Thatcher’s Housing ministers at the time of the Right to Buy personally owns at least 40 ex-council flats on one estate alone). But the biggest winners in this have been private equity companies and investment banks who are seeking a steady source of profits in the wake of buying large swathes of real estate, especially in London, artificially pushing up prices and rents even further. Where they’ve got rich, we’ve lost out. 800,000 people are on council waiting lists in London. Many have no hope of ever being re-housed. The truth is, there is no council safety net any more. Most of the decent stock is gone; over a third of it is now owned by rich private landlords and what is left is the worst housing in the poorest areas. For the UK’s ‘must reduce public spending’ state there is an unfortunate unintended consequence: A staggering increase in the cost of housing benefit as more and more of us are obliged to rent from private landlords. It is the most expensive working age benefit, and 85% of the rise in claims since 2009 has been from households where someone is in work. The bill stands at £24.11 billion, an increase of £3.24 billion under the present coalition. As Will Self put it in the Financial Times it’s “part of the wider asset transfer from the state to the rich”. And just to rub it in, rather than tackle high rents the g o v e r n m e n t has brought in several welfare “ r e f o r m s ” , including a cap on the amount of benefits any household can claim and the much despised bedroom tax. Faced with a growing need for social housing from a depleted housing stock, the government decided that in order to free up larger properties (especially needed in London), it would impose a tax on unused or under-used bedrooms. The results have been disastrous. Most tenants have lost an average of £14 a week in benefits, with housing association tenants losing an average of £16. A quarter of households hit by the tax have been pushed into rent arrears for the first time. In the first months of the new system just over half of all tenants from 51 housing associations could not afford to pay their rent. As a result, some 50,000 people are now facing eviction. Now one council tenant in three is in arrears because of it. People have been forced out of their homes and neighbourhoods and the impact has been horrendous. The main impact of the Help to Buy scheme so far has been in the north where housing shortage wasn’t a problem anyway. Again wealthy investors have cashed in on the scheme and so far its impact has been to push up rents and house prices even further. Again it’s a subsidy to the well off. Now that capitalism is facing life-threatening crisis all pretence that everyone has a right to a roof over their head is gone. Under capitalism, housing isn’t seen as a human necessity, it’s seen as an investment opportunity and the more houses bought up by rich investors, the higher the cost for the rest of us. As a result of investment in buy to let, London property prices have increased by 25% in a year. Moreover the whole situation is being made worse by local authorities. For instance many are trying to offset the cuts by selling off land, even when that means evicting their own tenants. Last year a group of single mothers occupied an empty block of council flats in Newham, East London. Their aim was to reclaim their flats after being told they would have to leave their estate as the council planned to demolish it. The mothers put up a brave fight for several months and eventually left the flats of their own accord before they were evicted. They’re still fighting under the banner of ‘social housing for all’. And in Hoxton, East London one of the biggest victories came when tenants took on and beat Westbrook Partners, a US based pension fund speculator which bought their estate then planned to evict everyone from it before refurbishing it and letting out at market rents. 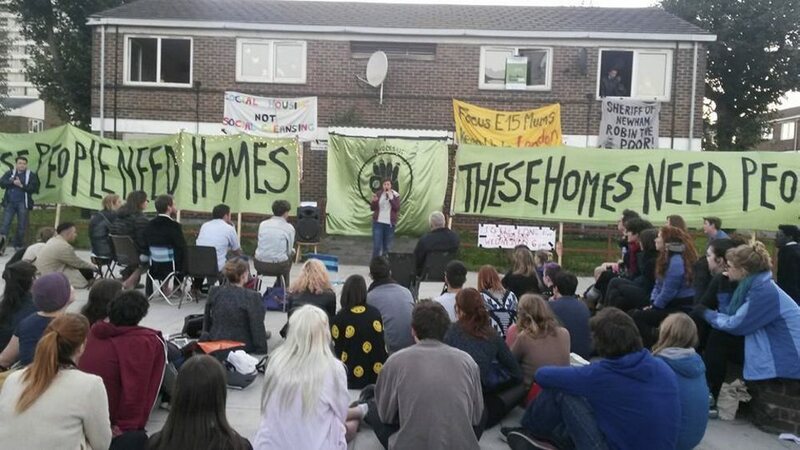 The New Era residents, led by three mothers, criticised the social cleansing of working class people from their neighbourhoods and eventually forced Westbrook to back down and sell to an affordable housing group. Anyone who stands up and fights like this is brave and their victories well deserved. As more battles become necessary, the more they link up with each other and share information and support the stronger they’ll be. It’s significant that people haven’t just accepted this lying down, they’re fighting back and winning. Collective struggle gives collective confidence and strength, ultimately for a wider battle. The truth is we’ve gone far beyond the point where anyone can really pretend that capitalism can solve the housing crisis. The women of Focus E15 are right; good decent housing is a human right and should be available for everyone. They are not taking things lying down. In the long term the housing crisis will only be solved when the working class has replaced capitalism with its own forms of government, when it can abolish rents and mortgages, give everyone security of tenure and organise housing according to who needs it, not who can squeeze the most money from it. We might be some way off from that, but in the meantime every organised fight for better housing is to be supported and applauded.